In your work with teams, you have heard the term start with why. This – why am I here? or why are you here or why does this team exist? – is often the first step in team performance and leadership. 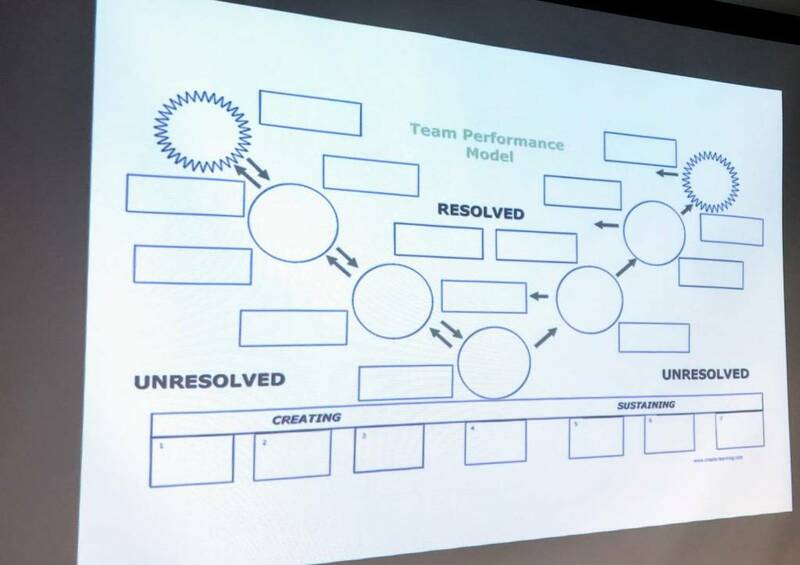 In the – 7 Steps to high performing teams workshop – you will see the Drexler/Sibbet team performance model, which I share as a map for teams. The term map is used purposely, as opposed to model. To create a model or linear process of human behavior or actions within a team(s) is impossible. People, teams, and leadership are complex and how they interact changes based on multiple factors when you view your team and consider your territory plus environment (current condition) you can think of it as a map. A map gives you an idea of where you are and shares ideas of where to go next. who does what, when, where? Wow! how did we get here? amplify? dampen? Using team performance as a map, we understand that people on teams and teams as a whole start and get stuck in different places along the map – and that the map is only useful when the people and the team are using a similar map. Working with many teams and viewing this map through a human-adaptive-system perspective, I have begun flipping the map to work with a team where they are at as opposed to an ideal version of where they should be. The – start with why – philosophy forces you into idealized thinking and leads to frustration that the why is not that well known. Recently we found that turning the map upside down and changing the discussion created the team why in a way that the team enjoyed and felt a stronger commitment to improving the team’s work. You can do this by starting with the current way the team works and ending with an agreement on why am I here? why are you here? why is this team together? who does what, when, where? Document and discuss who is doing what, when they do it and where it gets done. This supports your discussion of the current status and what is happening, through this discussion your team will find areas of overlap, gaps, and areas that need attention. how do we get work done on this team? Most teams have a fake or polished view of how work gets done, to see this in action look at the project updates to management vs. the actual way the team works. By looking at how the work gets done, how people work together, and what about those areas you and the team wish to amplify and dampen can make small changes to the task and improve team performance. what are we supposed to be doing? what are we doing? From the steps above you and the team can review your documented goals (possibly on your project charter) and what is getting done. You are expected to have differences here, this will point to patterns of what matters and does not matter as much. You can then discuss how do we move closer to the goals? and how do we move away from areas that may be hurting our progress? who are you? How the work gets done will show that there are divisions and some silos within the organization and processes that the team is trying to impact – do not fight these. Work through who is on the team, who are the stakeholders you work with, who is needed or not needed to make progress. From who are you ask – when this person has shown cooperation and resistance in the past? how much do they know about what we are doing? This step develops trust from small shifts to how the work gets done. why does this team exist? From the points above you can change and adjust the teams why to support the environment to get the work done. This may alter the initial goals and objective the team, and when that happens, the team will think about how they get work done around here. With teams and leadership the idea that you need a noble why can create a paralysis analysis and leave people lost, starting on the team performance map at how, creates progress through movement, and when teams start moving, you can determine progress-steps through interactions and discussions.